The Grizzlies lost by 61 points to the Hornets last month, the sixth-largest margin of victory in NBA history. The Grizzlies, who were eliminated from playoff contention two weeks earlier, played that game without three-time All-Star Marc Gasol. Gasol was not injured. His official reason for missing the game was "rest". He was not the only starter who was benched. Tanking – when teams are incentivized to lose games in order to improve their position in the upcoming summer's draft – has been an issue for years, but it seemed unusually bad in 2017-18. While the Grizzlies' embarrassing defeat was one particularly embarrassing example for the NBA, they were far from the only culprit. Other egregious actors include the Bulls and the Suns, both of whom shelved healthy starters for the majority of post-All-Star break games. By the start of April, at least eight teams warranted accusations of tanking. The first four teams to get mathematically eliminated from the playoffs saw their seasons end with more than 20 percent of their games still unplayed. With more than 10 percent of the NBA season remaining, nine teams had been eliminated from the playoffs, and three more had almost no realistic shot of making the postseason. At that point, barely half the league – 18 of 30 teams – was still playing for 2018. Once a team can no longer play for success in the current season, it reasonably turns its attention toward playing for the future. Basketball is unlike the other major professional sports in an important way: individual players participate in well over half of the game. Unlike football, baseball, or hockey (excluding goalies), several basketball players are directly involved in more than two-thirds of each game. In the other three sports, only hockey goalies are on the playing surface for more than half of the game. Furthermore, basketball has the fewest players on the court at any one time. A typical NBA starter accounts for roughly 13 percent of his team's total active player time. For comparison, a non-goalie NHL starter is responsible for less than seven percent of his team's active player time, and an NFL starter for less than five percent (the MLB figure is more noisy, but it's about 8 percent). At least in terms of playing time, a single NBA starter has nearly double or even triple the impact of a starter in any other major sport. Not only is the impact of a single player significant, but the structure of the NBA's collective bargaining agreement (CBA) allows a team to keep a player it drafted under contract for seven seasons – three of which are price-controlled far below the market rate for a top performer. Grabbing a star in the draft is a franchise-changing event, and no single trade or free-agent signing can impact a team in a comparable way. Under the NBA's current system, draft priority is given to the teams with the worst record. The first three picks are awarded by a somewhat-random drawing, while the rest of the draft goes in inverse order of the final standings. All teams that miss the playoffs are eligible for the lottery, but the lottery is structured to give the worst teams the best odds of winning. Under this system, whether or not a team wins the lottery to receive a top-three pick, they are better suited by losing more games. The NBA is in the business of entertainment. Its core product is competitive basketball. When teams tank, they are undermining the integrity of that core product. 1. The opponent is also out of the playoffs: In this scenario, both teams are incentivized to lose. The winner's victory is as meaningful as a victory in an exhibition game, while the loser gains an advantage in draft positioning. There have been 94 such games over the past five seasons, an average of 18.8 per season. 2. The opponent is still competing for playoff positioning: In this scenario, an opponent victory presents a "win-win" scenario. The opponent advances its playoff standing, while the losing team improves its draft positioning. There have been 432 such games over the past five seasons, an average of 86.4 per season. In both of these scenarios, the core product – the NBA game – is actively anti-competitive. Over the past five seasons, 8.6% of all NBA games have fallen into one of those two categories. Nearly one out of every ten NBA games fails to deliver the core product. Tanking is a problem because the current format for allocating draft picks rewards losing. To fix tanking, pick allocation must reward winning. Since the incentive to tank is exclusively based on the NBA Draft, any proposed fix to tanking must start by looking at the draft's objective. The draft is the league's primary method of enforcing parity. Maintaining parity is as important as avoiding tanking – just as it's not fun to watch a team designed to lose, it is equally unenjoyable if bad teams have no hope of improving over time. Anti-tanking ideas that reward winning are usually written off on the assumption that they will undermine parity. Instead of viewing the needs to incentivize winning and promote parity as an insurmountable obstacle, they can be viewed as parameters. How can a system reward winning, while still giving the worst teams the best chances to improve through the draft? The NBA should adopt a system that awards preferred draft positioning for the number of wins a team accrues after they have been eliminated from the playoffs. The worst teams are eliminated earliest, and so they would have the most opportunities to win games and position themselves for draft success – thus preserving the NBA Draft's goal of promoting parity. Teams that are eliminated closer to the end of the season would have fewer games remaining, but they'd also be better teams, and therefore have a better chance to win their remaining games. The opponent is also out of the playoffs: In this scenario, both teams are incentivized to win. The matchup could be determinative of which team drafts first in the upcoming draft. These games become the most important games of the season for the long-term future of the franchise. The opponent is still competing for playoff positioning: In this scenario, the eliminated team is now incentivized to play "spoiler" to the opponent's playoff aspirations. This decreases the impact of scheduling on the playoff race. Under the current system, a playoff contender would rather play a non-playoff team late in the season; under a WAE system, the non-playoff team remains incentivized to win all season long. Suddenly, a Mavericks/Suns game in early April would become a must-win game, as it could go a long way toward determining draft positioning. One of the biggest obstacles to serious draft reform is that, in many ways, the current system works. Whatever its faults, the NBA is profitable and growing. Tanking may be corrosive, but fans of bad teams have sincere hope that their future will be brighter. Look no further than the 76ers, the modern poster-children for tanking, who marketed the idea of "Trust The Process" and now have home-court advantage in Round 1 of the 2018 playoffs. The draft is working as a source of parity, and more importantly, as a source of belief that bad teams will get better in the future. Any draft reform needs to improve the quality of regular season play without radically changing the final order of draft picks. Fortunately, a WAE system achieves that goal. Multiplying a team's win percentage on the day of elimination by the number of games it has remaining provides an "expected wins after elimination" (eWAE). Over the past five seasons, the relationship between a team's date of elimination and eWAE was almost linear. In three of those seasons – 2012-13, 2015-16, and 2016-17 – the relationship was nearly perfect. With the exception of two teams in those three years, the earlier a team was knocked out of playoff contention, the higher their eWAE. Both exceptions were on track to be two of the worst teams of all time – teams that were only that bad because they were designed to tank the entire season. The graph below shows how draft picks would have changed over the past five seasons under a WAE system. It compares draft order predicted by eWAE to the actual final standings. 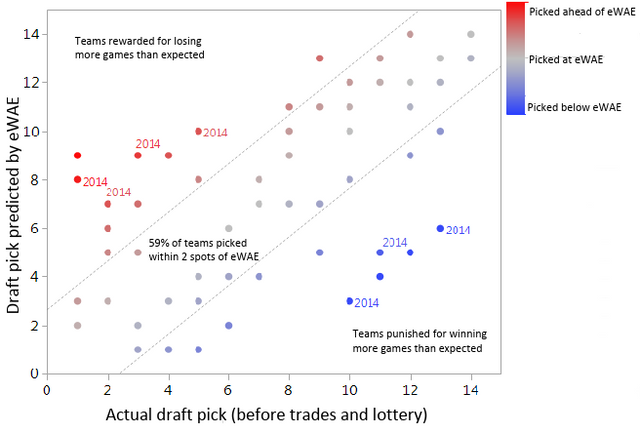 It shows that 59 percent of teams in an eWAE draft would pick within two spots of where they actually ended up, demonstrating that the WAE system results in minimal change for most teams. Though the incentives through the season would be flipped, the result is not a radically different draft order. During these five seasons, 11 teams moved five spots or more, but seven were from a single atypical season: 2013-14. The other four big movers were two "Trust The Process"-era 76ers teams (who were rewarded for losing an unexpectedly large number of games), and two teams that won an unusually large number of games after getting eliminated from the playoffs, and then were punished for those wins by moving back multiple spots in their respective drafts. Last summer, the NBA announced its latest attempted reform aimed at decreasing tanking. The new plan modifies the distribution of lottery odds, but otherwise leaves the current system intact. It might make a minor improvement, but it has zero chance of ending tanking. As long as draft priority is awarded to the teams with the most losses, teams outside of the playoff race will benefit more from losing than winning. To end tanking, the league must reward winning.